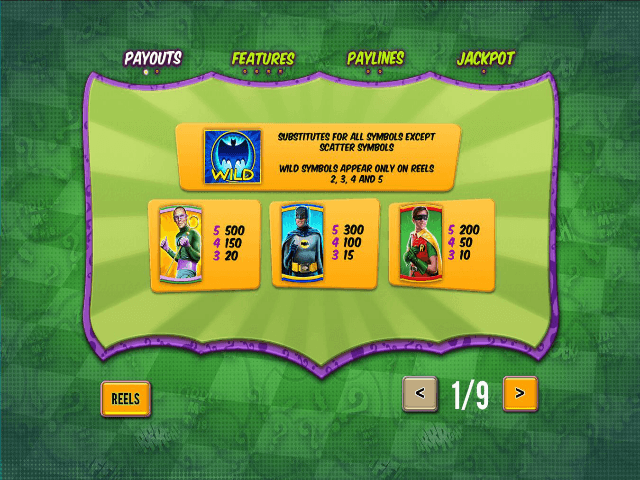 Batman and the Riddler Riches is part of Playtech’s series of online slot games based on the original Batman TV series from the 1960s starring Adam West. In this one, Batman takes on the Riddler, one of his most famous enemies. The Riddler is renowned for his obsession with puzzles and riddles, so it’s fitting that this slot contains a whole host of features giving you extra chances to win. Fans of Batman, whether the 1960s version or the modern super hero, are spoilt for choice when it comes to online slots based on the classic comic character, so read our review to see how Batman and the Riddler Riches compares to others in the series! 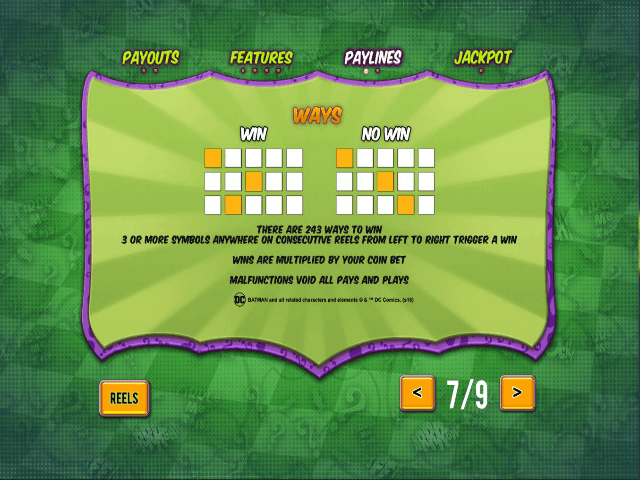 Play Batman and the Riddler Riches for Real Money! 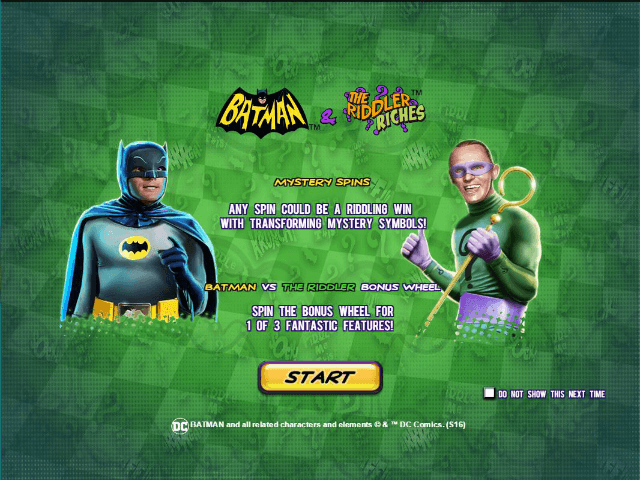 In terms of the design of the game, Batman and the Riddler Riches is similar to some of the other titles in the DC Super Heroes series such as Batman and the Penguin Prize and Batman and Catwoman Cash. The theme for this one is green – the colour associated with the Riddler. There’s also the same retro soundtrack as the other games based on the 1960s TV series. Fans of the classic series will recognise the symbols which include Batman, the Riddler, Robin, Commissioner Gordon, the Riddler’s hat and gloves and the statuette lever. The Wild symbol is the bat symbol and appears on all reels except the first. It substitutes for all other symbols except the Scatter. 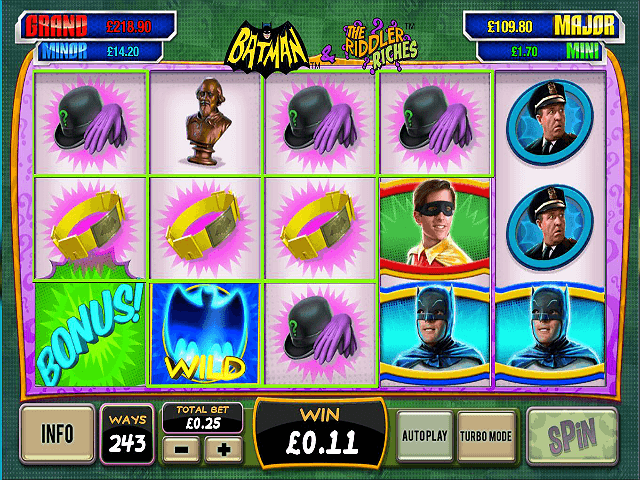 Batman and the Riddler Riches has five reels and 243 paylines with a coins range of 25p to £60. However, it’s when you unlock the bonus features that the fun really starts with this game, and you can find out all about them in the next section. Ten free spins are awarded and any sticky Wild symbol you land on stays sticky until the third wave of any collapsing reels. Click on the 12 boxes displayed until you find three matching values, and then you can click on three more boxes to find three matching multipliers which will be applied to the win. Awards ten free spins with a multiplier which increases by 1x (up to a maximum of 5x) on each successive collapsing reels win. When the wins stop the multiplier is reset. As with the other Batman slot games, you can randomly enter the DC Super Heroes Jackpot where you’re guaranteed to win one of the four progressive jackpots (mini, minor, major or grand). You need to pick from 20 icons and match three to win that particular jackpot. Share this Batman and the Riddler Riches Review today! 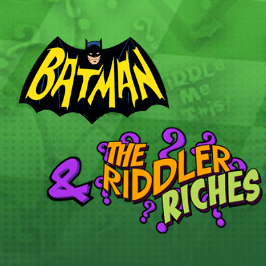 If you like Batman and the Riddler Riches, you'll love these slot titles too!